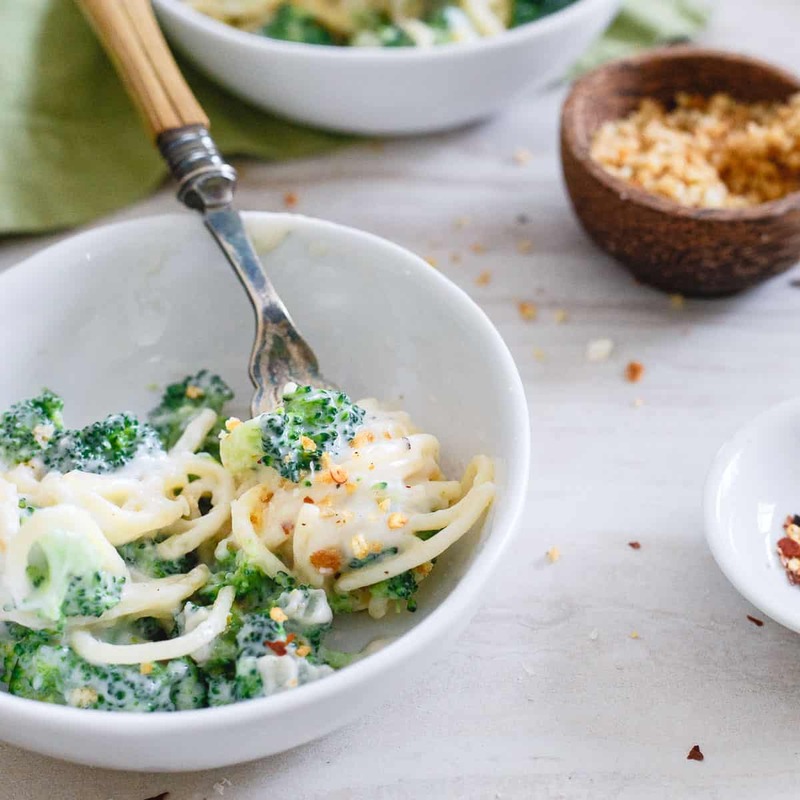 This Lightened Up Spaghetti Alfredo with broccoli is creamy, cheesy and decadent but much healthier than the original so you can feel good about eating it. *This post was originally published on 2/28/2012. The pictures and recipe have been updated but the text below remains original. This Lightened Up Spaghetti Alfredo is restaurant quality without the guilt (or stupidly high price you’re stuck paying for pasta dishes when you eat out!). It’s ready in just 20 minutes and sure to be a comfort food crowd pleaser. Hope you enjoy! This looks like a creamy heart attack on a plate doesn’t it? Oh, but it’s soooo not. Which means you can shovel forkful after forkful of delicious pasta into your mouth without that nagging feeling in the back of your mind about how bad of a decision it is. Alfredo sauce is that restaurant dish that haunts you. It’s the thing you know is absolutely horrible for you when you’re staring at the menu but your brain refuses to let go of the idea of the delicious creamy sauce. So, you throw caution to the wind, order the butter and cream laden dish and then before you know it you’re shoving half the contents of the bread basket down your throat and ordering tiramisu for dessert since you’ve completely thrown any attempts of healthy eating out the window for the night anyway. Please say it’s not just me? The alfredo bug bit me hard yesterday and before I knew it, things were coming out of the pantry and fridge and I was determined to show the sauce who’s boss with this healthy spaghetti alfredo. See that measly 1 tablespoon of butter? That’s it for the “bad stuff” in this recipe. Total creaminess achieved and barely a dent in my butter stash. Good for the wallet and for your heart. The rest of the creaminess comes from a combination of low fat milk, cream cheese and parmesan. Needing heavy cream or half and half for that alfredo taste is a total myth, don’t be fooled! From prep to roux to finished product this whole thing takes under 20 minutes. Beats the restaurant wait and there’s no bread basket or dessert menu to tempt you. Love this healthier spaghetti alfredo recipe? Try these other decadent but healthy pasta recipes: creamy tomato farfalle with peas and prosciutto, creamy butternut squash pasta with sage and mushrooms or pasta checca with burrata. Bring a large pot of water to a boil and add spaghetti. Cook until 2 minutes before al dente. While pasta is cooking, melt butter in a large skillet with raised sides over medium heat. Add shallots and garlic once butter is melted and cook for 2-3 minutes until softened. Add flour and whisk together, cook about 30 seconds. Add salt, pepper and nutmeg and continue to whisk until thickened, about 2-3 minutes. Once thickened, add cheeses and stir until melted and incorporated. At this point (2 minutes before pasta is done cooking), add broccoli to the pot with the pasta and cook for remaining 2 minutes. 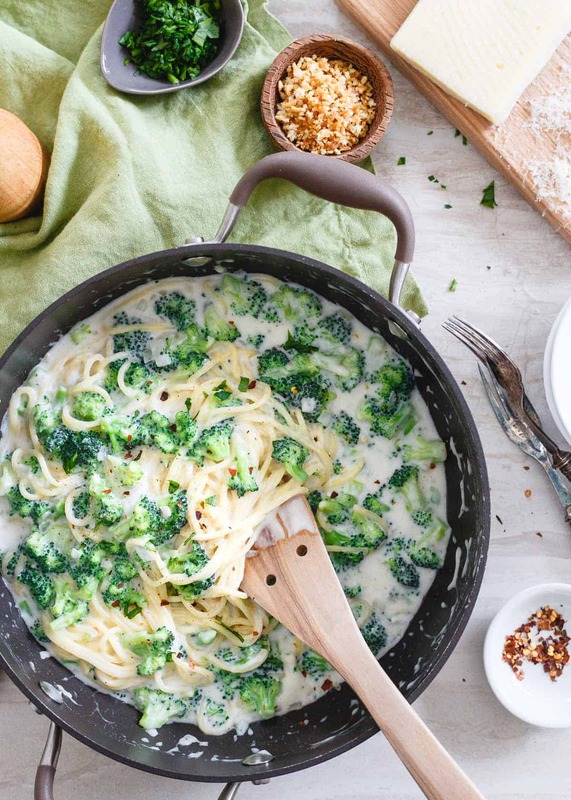 Drain pasta and broccoli in a colander and pour into skillet with alfredo sauce. Toss to fully coat pasta with sauce and garnish with additional parmesan, parsley, red pepper flakes and/or toasted panko breadcrumbs. You are absolutely not alone in indulging once in awhile. :) Your alfredo looks amazing… I usually prefer tomato, but my husband is a fan of alredo sauce so we’ll have to try this! 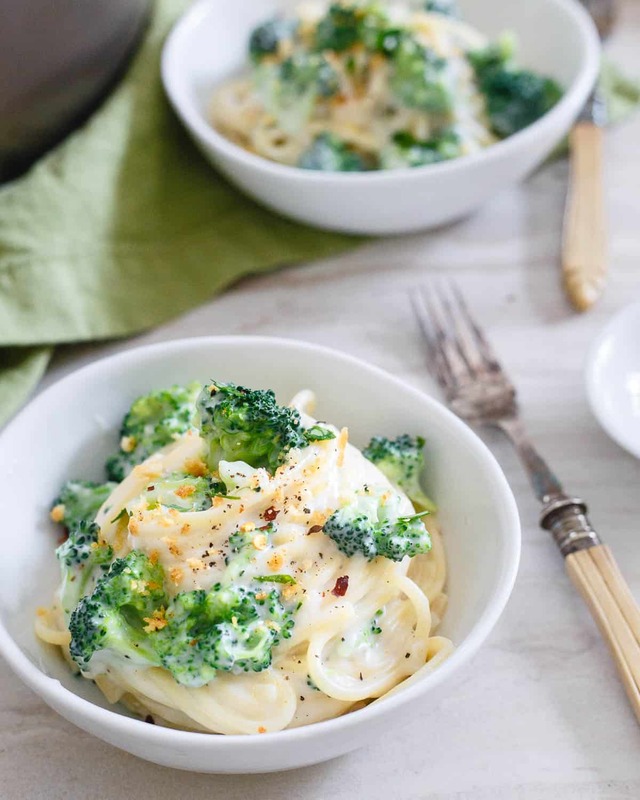 I love how easy it is to lighten up alfredo – love the broccoli in this recipe, too! We serve a dreamy alfredo sauce where I work and every time I’m wrapping up leftovers for someone the temptation to sneak a bite (or 10) kills me. Obviously I’d never do that but its so decadent looking. This sounds wonderful! I make a similar recipe with low-fat boursin. I LOVE it. I also make one on the opposite end of the spectrum for the skinny minnie, made with bacon fat, heavy cream, parmesan, and creamy, creamy tallegio. I love when I have all the ingredients at the house! Yum! This looks wonderful! I love the recipe! I’ve been craving pasta lately and this would satisfy that craving!! This is my kind of spaghetti… creamed with low fat milk and cream cheese and full of broccoli! I would eat a plateful and more without feeling guilty. Hope the foot is feeling better. yum, looks seriously amazing. not a super huge broccoli fan, but would love to throw some thick marinated, grilled garlic portobello mushrooms on here. thanks! Love portobello mushrooms, they would be sooo good! Definitely going to check out your cashew sauce. Thanks! Wowzers! I can’t wait to make this! Mmmm….looks awesome. And cream-based sauces always intimidate me anyway, so I’d be all over making this as opposed to regular alfredo! I’ve never been much of an alfredo person…but this makes me want to be one. I love alfredo too but I never order it because I know how bad it is for me when I make it at home…it can only be worse in a restaurant. Besides my throwing calories out the window pasta dish is carbonara. Thinking about it makes me drool. This looks like the best alfredo! I’m all of a sudden starving, looks delicious! I can’t wait to try this! I love me some alfredo on occasion and this looks like a great recipe! You have just make a hard-to-photograph food look sooooo amazing ! I want to reach thru the screen and gobble it up. Now. The newest issue of Rachael Ray (I know, I know, everyone either loves her or hates her, but mag has some good recipes! ), and they had a lightened up Alfredo that didn’t have any butter, just a few tablespoons of olive oil and flour to makes a roux and then 2% milk (I used skim), chicken stock, and fresh Parmesan cheese to make the sauce. It was creamy and delicious and I totally had my family fooled! And wow, I’m completely stealing your thunder on an awesome recipe you developed! 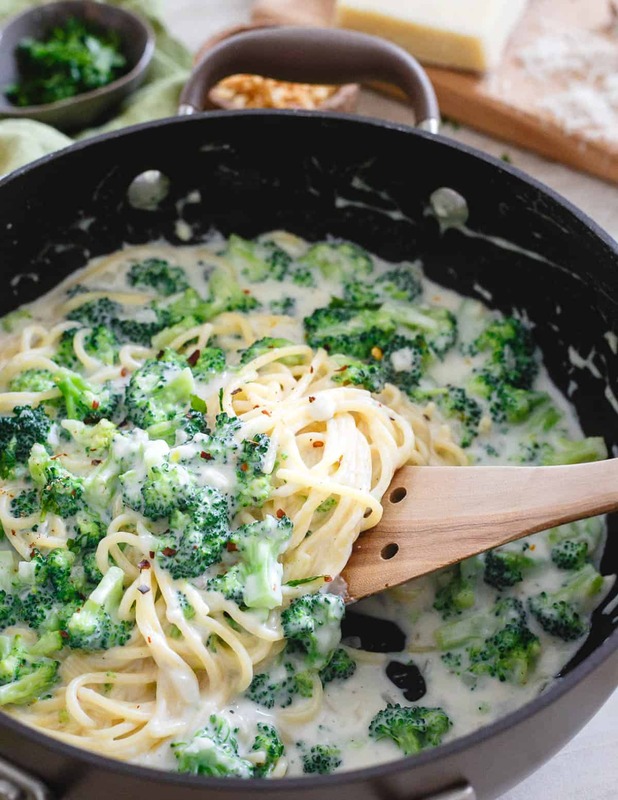 Your Alfredo looks so yummy, and I love the addition of shallots and broccoli, they must be such a yummy flavor boost. Plus, there’s cream cheese in this, and, duh, I’ll eat that stuff all by itself. I’m gonna try this one next and see what the fam thinks! haha no worries. I used to get her magazine but stopped it b/c I was too overwhelmed with all the recipes and things I ended up dog earring! can’t stand her or her voice but love her mag :) I’m glad you told me about that version b/c I’d love to try one without any butter! No its not just you and thank you so much for this. i love Alfredo with all my heart and soul but always feel so GUILTY for eating it. Now I am free. Thank you for setting me free. Oh it’s totally not just you. Every Saturday night is my cheat meal night and when I actually allow myself to shove stuff like this down my throat and then dessert, too. Awwww yeah. I’m so going to make this next week – we found out P is kinda allergic to tomatoes (hopefully she will grow out of it asap) – and she LOVES spaghetti with sauce on it. Literally want to dive into that sauce! Love this lightened up version Gina! My kinda comfort food. Looks awesome! Love how it’s lighter too. This looks so good! Love it when you can make comfort food in a healthier version like you did here! Love this lightened up version of one of my all time favs! Alfredo is so tasty! I love that I can eat this and not feel as weighed down! my hubby loves alfredo and I love that this one is lightened up! I love pasta and your recipe shows a completely new way of how to prepare them, Gina! This spaghetti alfredo recipe is an excellent post-workout meal which I am so inspired to prepare! Does anyone know the nutrition facts on this recipe? It looks absolutely amazing and I cannot wait to try it but just want to log into myfitnesspal too! You can import the recipe into MFP by copying the url to calculate the nutrition facts yourself if you’d like.